Get the best rate on luxury holiday apartments at the V&A Waterfront. Accommodation offering security, a fully-equipped kitchen, hotel conveniences, and 24/7 local guest support. It is easy to see why the V&A Waterfront has become one of South Africa's most popular attractions. Apart from being beautifully situated on the ocean facing Table Bay, it offers great scenic views of Table Mountain, the city of Cape Town and the vast Atlantic Ocean. It is a vibrant shopping and entertainment hub with a range of restaurants, cafés, bars and bistros, cinema complexes as well as speciality stores, boutiques and craft markets. Named after Prince Albert and his mother Queen Victoria, the Victoria & Alfred Waterfront is a favourite with locals as well as domestic and international visitors. 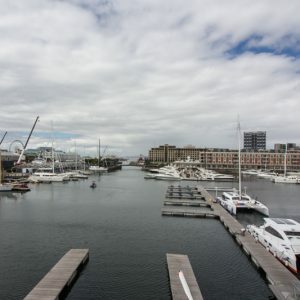 Another big attraction is the fact that the Cape Town Waterfront is still a working harbour and watching boats coming in to dock is a big drawcard. From fishing boats to tourist charters and luxury sailboats can be observed surrounding by seals frolicking in the water among seagulls. 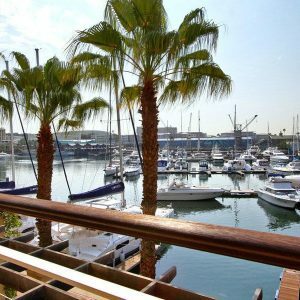 Some of the finest properties in the country can be found at the upmarket marina development at the V&A Waterfront. A gorgeous location and stylish architecture and design contribute to the cosmopolitan atmosphere, ensuring a sophisticated and upmarket holiday experience. 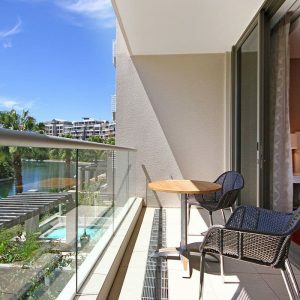 Completely safe and surrounded by 24-hour security, there are over 500 luxury self-catering apartments, stunning penthouses, some with pools and views available for both short and long-term rental. All the apartments are a short walk along private and landscaped walkways along the canals from the heart of the V&A Waterfront. The security is state-of-the-art, with full perimeter security, electric fencing, and CCTV, access-controlled gates and video monitoring from all apartments. 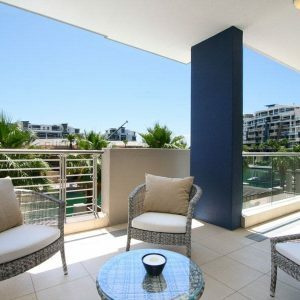 The Cape Town Villas website has a comprehensive portfolio of V&A Waterfront apartments, listing a vast number of properties according to facilities, size and amenities with good photographs showing visitors exactly what they may expect of each apartment or villa. Contact us and talk to us directly. Anyone of our knowledgeable staff members will be happy to assist you. 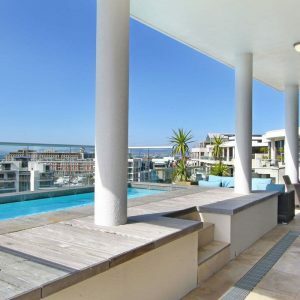 Considering that there are over 500 luxury apartments and 200 boat moorings, the choice really is yours when it comes to picking the right spot for your holiday or stay in Cape Town. As the V&A Waterfront is such a top tourist attraction, one may be forgiven for thinking that the V&A Waterfront Marina is noisy and busy. Quite the contrary is true, in fact. The residential development is set apart from the hustle and bustle of the V&A Waterfront, discreetly tucked to the side, visible as one enters the complex, on the right. Facing the yacht basin and the canals, these attractive apartments all have extensive views and are expertly placed to ensure privacy. 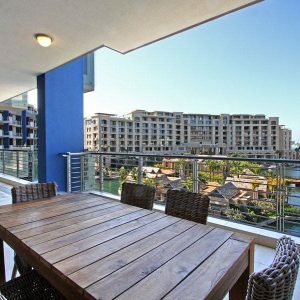 For holidaymakers looking for quality accommodation in a prime location, it would be hard to beat the V&A Waterfront in Cape Town. So close to the city’s main attractions as well as near all the major roads to surrounding favourite destinations makes it truly ideal. 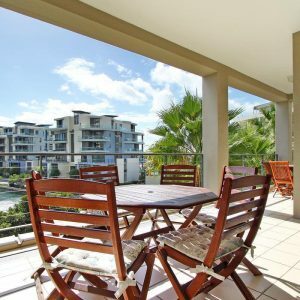 Perhaps one of the biggest advantages of booking an upmarket holiday rental in the V&A Waterfront is the convenience. Being able to walk to the heart of the Waterfront means stress-free access to the many leisure and adventure activities. Boat charters on the ocean, sunset cruises and trips to Robben Island are easily booked and you need not wait in lines or make advance bookings. There is something for children of all ages at the Waterfront too – from movies to games and a large play area for smaller children. Another great aspect of booking one of these stylish establishments is the fact that it comes with many complimentary services – like a concierge and cleaning service, meaning you don’t have to clean up, tiring yourself out on your vacation tidying up after the children! The residential areas also have swimming pools, fitness clubs and relaxation areas. There is so much to do and see at the Waterfront itself and visitors to the city may want to start right here before venturing out into the rest of this scenic city. Did you know that the Waterfront can trace its history right back to the first settlers in the Cape in 1652? Further construction of the harbour – today part of the V&A Waterfront - took place in the 19th century and many heritage buildings in the Waterfront were built then as well. For instance, the beautiful Clock Tower with its red-and-white façade draws the eye. This Victorian Gothic-style structure was part of the Port Captain’s Office and dates back to 1882. It was painted red back then too and the building has been maintained carefully to keep it historically intact. Being able to stay at the V&A Waterfront provides great peace of mind to travellers, especially those coming to Cape Town for the first time. For families with children, there is the added benefit of having swimming pools and landscaped gardens that are completely safe for them to play in. All of the apartments and villas to rent in Cape Town provide families with a superb stay and the opportunity of having the holiday of a lifetime. Regardless if you are looking for accommodation for one night or several nights, if you are thinking of a week or even a month, booking an apartment at the V&A Waterfront is flexible and convenient. Thinking of staying at the V&A Waterfront? We at Cape Town Villas have been doing this for a while – let us help you find the right villas to rent in Cape Town. 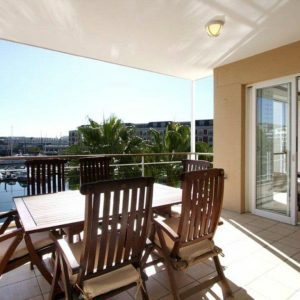 We know how to arrange the perfect holiday apartment in Cape Town for you. We have assisted many travellers and know your concerns and requirements. Of course, some may say the V&A Waterfront sells itself - in terms of location, proximity and luxury facilities, these V&A Waterfront accommodations are unbeatable. Each year, the city of Cape Town wins accolades from travellers from around the globe. In 2016, the city was named as the best city in the world by the UK Telegraph and readers from Conde Nast voted it as the best food city. It is estimated that a whopping 1.52 million visitors came to Cape Town in 2016 to see the ocean vistas, Table Mountain, Robben Island and other top attractions like the V&A Waterfront, the Kirstenbosch Botanical Gardens and Cape Point. Apart from its natural beauty, there is a vibrant and cosmopolitan feel in the streets, with many interesting sights in the city centre as well as further afield. It is a hip and vibey place, home to various cultures and is loved by musicians, artists, outdoors enthusiasts, surfers, and nature lovers. The city has a big film industry too and during the summer months, models, actors and directors flock to Cape Town to make the most of the golden light and the good locations. In peak seasons (October-February), finding rental accommodation in Cape Town and the Waterfront can be tricky – so it is best to book early! 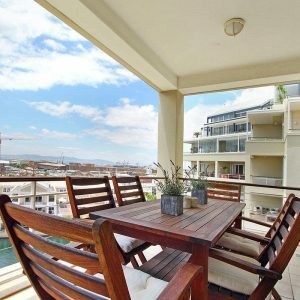 Due to its popularity, apartments close to the V&A Waterfront get snapped up quickly. Don’t despair! We at Cape Town Villas are always available and ready to help you with any queries regarding rental properties and holiday stays. Give us a call or drop us an email – we will be more than happy to help! Even if you cannot find a holiday house at exactly the address you had in mind, it is always possible to find a home or apartment a little further away. Sometimes lesser known properties offer even better prospects to visitors – and many a visitor has had their minds blown by the gorgeous properties we were able to find for them. Undoubtedly, Cape Town’s biggest appeal must be the sun-kissed beaches. Cape Town has several beaches that have Blue Flag certification – which means that they are certified for being clean, safe, managed environmentally and meet other high, international standards. The city of Cape Town has the largest number of Blue Flag beaches in the Western Cape province. The city prides itself on maintaining these beaches with adequate bathrooms and parking and ensures that beaches are safe and secure to visit for families from all over the globe. They also see to it that the beaches meet international tourism standards. Three marinas have also been given Blue Flag Status - the Water Club in Granger Bay at the V&A Waterfront is one of them. This means that visitors to Cape Town’s beaches may rest assured when it comes to sunbathing near the waves, playing with the children building sandcastles or going for long strolls along the coast. Of course, for many visitors, the ideal holiday home is one close to the beach or within five minutes by car. While these tend to be popular, something is always available if you know how to look – and we at Cape Town Villas certainly do! 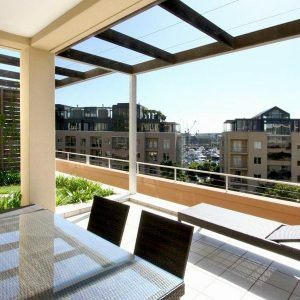 Have a look at our extensive accommodation listings pages to see our vast portfolio of rental properties. Some visitors prefer being closer to the city centre as well as the world-renowned Victoria and Alfred Waterfront. This makes travelling to various attractions much easier and it can also be convenient to be close to large entertainment areas. In addition, many of these listings feature extremely safe and secure properties for visitors. Many rental houses and apartments are within walking distance of the V&A and this is fantastic especially for groups who may not have a car or want to be within walking distance of attractions. The V&A Waterfront offers visitors so much – from shopping to movies and boat cruises, playgrounds for children, restaurants and bars as well curio shopping. The construction of luxury suites at the V&A Waterfront is a fairly recent development and addition to the waterfront marina. Surrounded by canals and with breathtaking sea views, these self-catering and luxury apartments are ideal for those coming to Cape Town for short – or longer visits. Completely self-contained and lock-up-and-go, they offer all the conveniences of home with stylish interiors, modern fittings and features. The apartments have been named for ships that sunk off the Cape coast, i.e. the Altmore, Bannockburn, Carradale, Dovenby, Faulconier, Juliette and Kylemore. On sunny, summer days it can be hard to believe that the Cape of Good Hope (as it was known initially) was also referred to as the Cape of Storms and many a seafaring vessel was no match for the rough waters surrounding Cape Town. This touch of drama adds to the intrigue and mystique of the city, of course. The Cape Town Waterfront is one of the city’s top tourist attractions, with all visitors to the city reported visiting the complex at least once. The charm of this working harbour lies in the combination of the historic charm of the renovated buildings and harbour developments side-by-side with restaurants and boutique shops. It is a sophisticated and charming hub of entertainment, shopping and relaxation. It was reported in 2016 that the V&A Waterfront had in the course of the year seen 11,8 million people. This is pretty impressive, considering that this waterfront started off as a small jetty, way back in 1654, built by the city’s founder, Jan van Riebeeck. Over the years, various additions were made to the harbour and its size slowly grew. The shopping and entertainment centre was the latest addition and the way it flows and intersects with the harbour is one of its biggest appeals. Another big attraction at the Waterfront is the new Zeitz Museum of Contemporary Art Africa (Zeitz Mocaa). It opened in September 2017 to much fanfare and the building itself is worth a mention as the renovated grain silo is a feat of architecture and design resulting in a spectacular structure incorporating tubes, glass, steel and soaring spaces. The museum showcases the finest contemporary work by artists from South Africa and the continent and is definitely worth a visit. While locals have little trouble picking their favourite holiday destinations in South Africa, international visitors may find it a little intimidating. Considering the country’s size and the many attractions, it can be quite daunting to plan a holiday. Officially designated as one of the 7 New Wonders of the World, Table Mountain is instantly recognisable and the best-loved landmarks of the city. The mountain has a characteristic flat, “table-top” appearance and is often covered with cloud – fondly referred to as its “tablecloth”. It overlooks the city and the CBD and main neighbourhoods, as well as the University of Cape Town, nestled on its slopes. The fauna and flora on Table Mountain are unusually rich and belongs to the Cape Floral Region, which is a protected World Heritage Site and is estimated to include over 2 000 different species. Hiking up Table Mountain is a popular activity and the cable car going all the way to the top is probably the most popular activity for tourists in Cape Town – weather permitting! The Cape Winelands refers to a region just outside of the city of Cape Town. The green vineyards and historic wine estates of Stellenbosch, Paarl and Franschhoek are easily reached for half-day or full-day outings of wining and dining in lovely surrounds. Many of these wine farms have renovated homesteads and award-winning cellars where wine tastings and gourmet lunches may be enjoyed. The most south-western point of the African continent is at Cape Point, about 50km from the centre of Cape Town. Featuring spectacular rock cliffs and a breathtaking view of False Bay, Cape Point is often at the top of any visitor’s list. The first lighthouse here was completed in 1859 and provided sailors with an important beacon – to help prevent shipwrecks and keep sailors safe in the treacherous waters of the Cape. Those coming to Cape Point today will enjoy the walk – or ride by funicular – to the lighthouse as well as the lovely restaurant with delectable seafood fare. As it lies in a nature reserve, visitors to Cape Point also get to see some of the region’s famous fauna and flora as well as some antelope and wildlife. So many reasons to visit Cape Town, but so little time. If you are still pondering your many choices, don’t hesitate to ask us for some guidance. We at Cape Town Villas are the experts at planning unforgettable holidays and we would love to make some lovely memories for you. 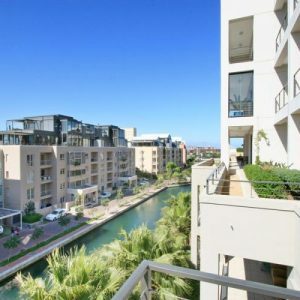 In terms of location, proximity and luxury facilities, these V&A Waterfront apartments are unbeatable. 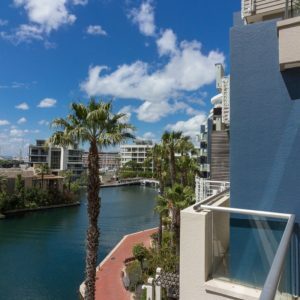 Let us help you find the right apartment to rent at the Cape Town Waterfront. Just call +27 21 201 1495 to speak to a local villa expert, or browse the properties below and request a quote. Elegant and modern, this two bedroom apartment is perfect for weekend getaways, or a "home away from home" if you want to enjoy a longer stay.